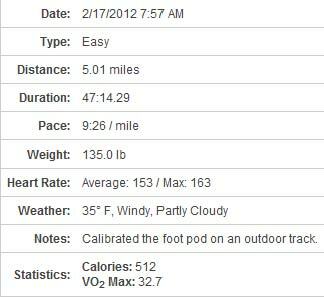 I had a five-miler on the schedule today, and since the snow melted yesterday, I decided to go to the high school (outdoor) track and recalibrate the Garmin foot pod. I didn't know this, but one of my readers pointed out that indoor tracks are measured differently (from the middle lane) rather than the inner lane like an outdoor track. So my calibration was probably off when I was running indoors a few days ago. I'm probably not as fast as I thought. Bummer. But at least now I know. I went to the outdoor track and ran two laps (800 meters). Then I did 4.5 more miles, for a total of 20 laps around the track. When I think of 20 laps, it doesn't sound like much, but it was boring. I like the indoor track much better. But I really need to go back to running on the road, at least for most of my runs. Tomorrow and Sunday are both rest days, but next week I'll probably be doing a couple of dreadmill runs because my kids are off of school all week for winter break. So I'll be interested to see how accurate the treadmill is compared to the newly-calibrated foot pod. After I showered and dressed, I had to go to H&R Block to sign my tax papers. My aunt works there, so she does our taxes for us. We're getting a $4,400 tax return, which is about what I expected. I want to put it toward our debt, but we desperately need new carpeting, and I think we're going to do that. We've had the same carpet since we moved in in 2003, and we've had dogs, cats, two babies (now children) in that time. So you can only imagine all the years of baby spit-up, milk, food, dog pee, cat puke, and other stuff that is lurking in our carpet. Jerry and I were talking about giving something up for Lent. Lent begins next Wednesday, Feb. 22nd. We're not Catholic, but I do like to give something up to practice the self-discipline. When I was losing weight, I gave up white flour/white rice/white pasta (basically any refined grains) and I discovered SO many new foods. It was very eye-opening for me. I like to pick something that is going to be the most difficult for me to give up. Can you guess what it will be this year? I'll give you a hint. It makes up approximately 95% of my diet. Yep, peanut butter. Well, more specifically, NUTS. This isn't set in stone, so don't hold me to this, but I'm pretty sure I'm going to give up nuts for Lent this year. It will be the most difficult food to give up. Anyone else giving up something for Lent? But they are such a good snack for protein!! I don't think I could give nuts up! Refined grains, easy (for me, at least) but nuts?! No way! I don't do Lent, but I'm trying to give up soda. It's hard because it's ALWAYS in our house as my husband uses the caffeine for his headaches. I don't drink it often, but I'd rather not drink it at all. I'll do really well then I'll have a soda with dinner one night and BOOM. It's like crack (or what I'd imagine a crack addiction would be like anyway!). I am exactly the same way with soda! I managed to stop drinking it for about a month last summer and then we went on vacation. I still didn't drink it for a couple days and then I had just a little taste. It didn't even taste that good, but I was hooked again. So I am thinking of giving up soda for lent also. I need to...it's just the first week off of it so so painful for me....headaches and lethargy...ugh. Have you tried sparkling water mixed with a pure fruit juice? I have found I really miss the carbonation more than anything (weird?!?!). I am going to give up all pop for lent and see if the sparkling water mixed with a small amount of fruit juice will quench my cravings. Good luck. I gave up soda for Lent for a couple Lents ago and haven't had one since. The year my husband and I are giving up meat and will just eat eggs, fish, and shrimp. Katie, did you watch Dr. Oz today? It was the first time I ever watched his show but it was all about snacking! Eat More Lose Weight! There were some really fantastic ideas and all of them were under 200 calories! I haven't decided yet. One year I gave up meat, which I really liked. I found bunches of new recipes, and found myself eating healthier and getting creative the few times I went out to eat. Plus I saved a lot of money! My husband and I stopped eating supermarket meat after seeing "Food Inc.", and the meat we but from farmer's markets and Whole foods is expensive! Beans and legumes and such are much cheaper. lol. I have been thinking about giving up refined sugar.. I am not 100% set on it, but I know it would really be good for me! Of course, my absolute FAVORITE candy (cadbury mini eggs) is out in full force now that Valentine's Day is over. It will be hard for me to pass those up, but I really need to make a change. I am hoping that if I can make it the first week or two, I will be ok for the rest--and, if I can make it the 6 weeks of Lent, maybe I won't go back. PS-this is my first time commenting on your blog. I only found you a couple of weeks ago, but I have been trying to read through your posts from the beginning. You are very inspirational to me. Thank you for putting your journey out there for all to see. You make me really want to give up something, but I really don't want to give up anything food related! There seems to be so little I actually eat, so I dunno. Maybe I'll give up something like TV, but that wouldn't be so hard because we don't have cable! Give up something? Maybe I could add something instead, I find drinking all that water very difficult. If I had to give up something else (I've already given away: gluten, wheat, refined sugar, lactose) I'd like to give away corn and rice too. That's really difficult to do though - for me at this stage. I'm fighting my family to do that! I usually give up chocolate, but that doesn't include chocolate FLAVOR, like Chocolate Chex or plain chocolate ice cream! Lent also means no meat on Ash Wednesday and Fridays for us. We'll eat plain pastas or potatoes and eggs... My grandmother used to try and convince us that we could eat what we gave up on Sundays and we thought she was just making it up, until I looked it up. Lent is 40 days, but there is 46 days between Ash Wednesday and Easter, so Sundays really aren't included in Lent! But, I know you, you don't do cheat days, so you'll stick to your guns, right? Why not give up just nut butters or just whole nuts? Good luck everyone! I haven't decided what I am giving up yet, but I can tell you nuts/ peanut butter would be a hard one for me. So rock on if that is what you choose. I will cheer you on. Interesting fact about the Garmin. I just got mine yesterday and am so excited to start using it. I need to go back over your info post on it. Good Luck with Lent. We are not catholic either and don't practice it. I think it is a great concept though. I love getting a Tax Return, but hate deciding what to do with it. This year, since we have no real debt, we decided to take a vacation with just the two of us. We haven't don't it since our honeymoon. Hotel and all I am so excited!! Aww, that's awesome! Have a great vacation!! Giving up nuts!? No way! ;) Sweet tax return! We just paid off the last of our credit card debt-let me just say-it's better than new carpet. My vote is-spend a bit & get them professionally cleaned & pay the rest on debt. Not having those monthly bill's is an AMAZING feeling.Next year buy the carpet! Unfortunately, our debt is going to take MUCH longer than a year to pay off--more like 6-8 years! Our carpet cannot last that long :( We've had it professionally cleaned once or twice a year, but it's definitely time for new carpet. Congrats on paying off the last of your debt!! That has to be an amazing feeling! We, too, are supposed to be getting a rather sizeable tax return and I'm not sure what we'll do with it, either. We should use it to pay down debt, also, but it would also be nice to have a bit of a nest egg, just in case. Sort of counter-intuitive, I know. I am going to give up pop for lent. I drink too much, even though I have cut back significantly. I know the Mt. Dew cravings will kick in by the weekend. I am Catholic so I try to give up something, but usually cave a week in. I am at the beginning of a weight loss journey and I think the added sugar pop brings should be cut out to help me out.